Ok, this suggestion includes a new type of mob, with new items as drops, found in a new dungeon, and also some new blocks. Basicly, they will be giant ants. There are three varieties. All ants would randomly spawn inside the area the tunnels occupy. This would be similar to the mechanic guardians have. Ants spawn when there is a solid block beneath them, and at any light level. Furthermore, no other mobs would spawn in this area because the ants “already got ‘em”. Along with the ants spawned naturally, ants will also spawn with monster spawners in special rooms within the dungeon. This would make specific types of ants be more common in specific places, and make ants appear from seemingly nowhere. More in Depth spawning- Thanks to Ouatcheur! So it would require Pack Spawning to check if the chunk contains an "Ant Tunnel" tag, and if it does, no hostile or passive mobs will spawn in that chunk, and ants will spawn instead. This is like the pack spawning with Ocean Monuments where only guardians can spawn (a dark, hollowed out monument won't have mobs spawn in it). So there is a bounding box over the ant dungeons that allows ants to spawn there. Pack spawning would also further divide the ant dungeon into separate, ant dungeon chunks. Each chunk could choose to have a different ant type weight (like one has 50% each ant type, one has 25% worker, 75% soldier, ect), so different ants spawn more commonly in different chunks. Rooms inside the dungeon can spawn based on chunk as well, so that there is always the correct proportion of ants in the correct room. Worker ant- "Baby" model for the ants I guess you can say. About 1x1x0.5, or as big as a cave spider. Immune to the slowing effects of resin(more on that later). Melee attack strength of 5 on Easy ( ), of 7 on Normal ( ), and 9 on Hard( ), along with Knockback I. Same amount of armor as a fully leather armored player. Also gives the player a “Irritation” effect for 30 seconds, which halves all types of healing and hunger gain (Thank you Ceroz for suggesting that! 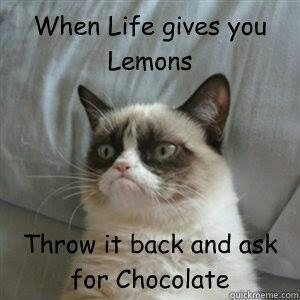 ), and Nausea for 3 seconds. Ant Queen- Like the "Elder" class of guardian, or a Mini boss. About 2x3x1.5 blocks in size, or as big as a short horse. Has the same armor as a fully chain mail armored player. Moves slightly slower than a normal spider. (90% of a spider's speed) Also does not wander much. places a resin block at a players feet randomly if the player is in a 3 block radius (randomly, like every tick, there is 1/30 chance of it doing this) More on resin blocks later. Melee damage is comparable to a normal zombie. (Easy: 2 ( ), Normal: 3 ( ), Hard: 4 ( )) Melee range is one block in front of it's head. Slow attack speed, because if you're in melee range, you're probably stuck in resin. Worker ants are actually neutral. Soldier ants and Ant Queens are not though (they are aggressive). The worker ants will not bother you until you attack any kinda of ant. Example: You gain entrance to the ant dungeon, and all the worker ants are wandering around doing their thing. A soldier ant then immediately comes up ant tries to attack you. After you hit the soldier ant, all the workers will become aggressive to you too. 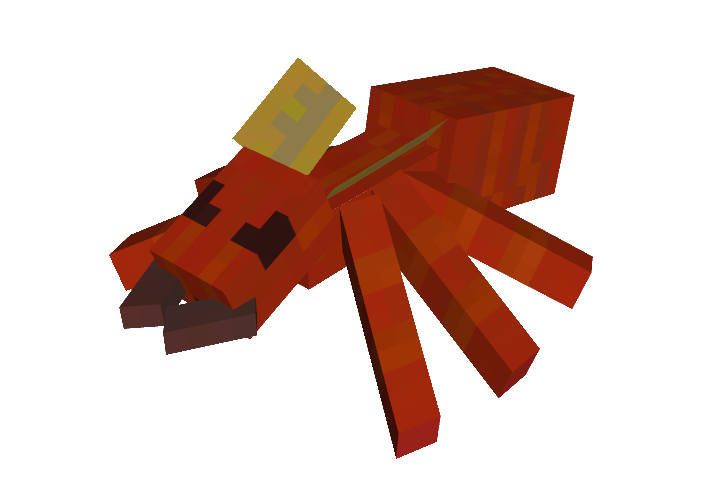 Ants will also attack all mobs, both hostile and passive. 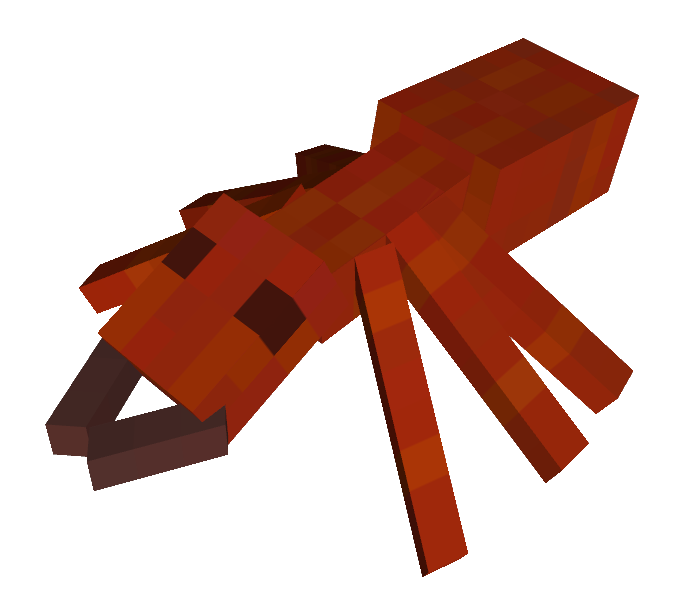 The only thing is, all hostile mobs are also hostile to ants, and mobs killed by the ants don't drop anything (to prevent them from becoming a substitute to iron golems). Ant queens will actually retreat to the nearest ant after being hit (along the x,z axis, I don't want them wandering to the closest ant above them). As many people have suggested, ants now spawn around the ant queen, but they do so in a different manner than you may expect. Ants (75% of them will be soldier ants, 25% worker ants) will spawn within a 12 block radius from the ant queen, but will not spawn within an 8 block radius of the queen. 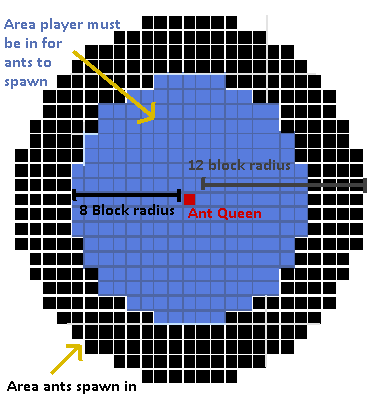 More so, ants will only spawn if the player is in an 8 block radius with the queen. This would make the ants occasionally spawn behind the player, or in different rooms adjacent to the Queen’s room. This is meant to simulate all ants in the hive travelling over to save the queen (because many of the times, the ants would spawn out of view, or at the entrance to the room). The ants the queen spawns will also automatically target the player, even if the ant does not have a direct line of sight with the player. About 2-4 ants spawn each time, and spawn with the same frequency of a monster spawner. 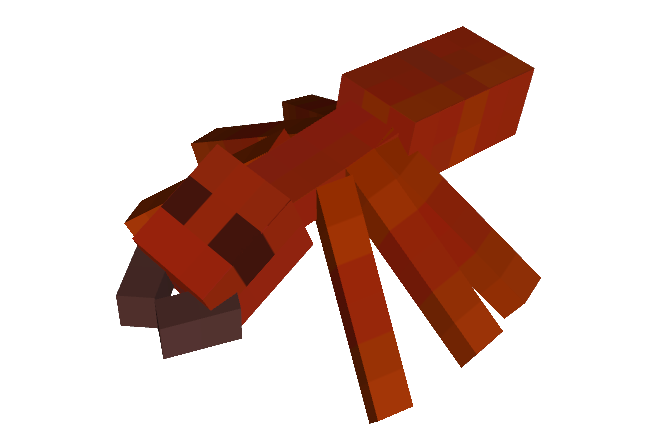 Soldier ants also rarely drop mob related items, like rotten flesh, string, bones, and gunpowder, but only if killed by the player. They also have a unique drop, an “ant stinger” ( ) which is a potion ingredient, and is dropped normally. Can be brewed with an awkward potion to make an “Irritation I” potion that has a duration of 3 minutes. Ant Stinger’s are “bad food” like spider eyes, or rotten flesh. Has an 90% chance to give you the “Irritation I” effect for 7 seconds when eaten, has the same amount of saturation and hunger points as a spider eye. Ant queens have a 50% chance to drop an Ant Queen head, and commonly drop whole resin blocks themselves. Note- Some ant colonies would be Polygyny, or have multiple queens. The dungeons the ants spawn in appear in any type of Mesa Biome. They have a 1/150 chance to spawn around any specific chunk within Mesa Biome. It looks similar to caves, but always connects to the surface, and with hardened resin blocks and red sandstone mixed with the naturally occurring hardened clay. The caverns would look like this. At the end of each dead end in the tunnels generated like this, there would be one of several specific rooms that can form. All rooms have a weight value, which will help the game determine which room has what probability to spawn. Notice! Room weight values are prone to change. Hatchery room- This is the only room that contains spawners. There is one worker ant spawner in here, hidden under a pile of "soft" non-drying resin blocks. Actually, there would be many, many piles of "soft" non-drying Resin Blocks. everywhere. 75% of ants spawned here through natural means are worker ants, 25% are soldier ants. Resin blocks are like the combination of a slime block, sand, and cobweb. It looks like a amber colored slime block and has the slowing effect of one, is affected by gravity like sand, and you fall into it and are slowed like a cobweb. There are also two types of resin blocks, those found naturally in the dungeon, and those you can craft. Naturally generated resin does not dry out (more on that later), but crafted resin does. "Soft" Resin can only be picked up with a shovel, and can be crafted with a 2x2 crafting grid filled with resin nuggets. Breaking a soft resin block will drop 3-4 resin nuggets as well, similar to snow or glowstone. Similar to how crops grow, resin blocks have a timer. After a random period (similar to crops), the crafted Soft Resin will harden into Hardened resin, which is mined with a pickaxe. These have a dull amber color, and are useful for decoration. Similar to farmland, a water block close-by to a crafted resin block will prevent it from becoming a hardened resin block. Hardened resin blocks however will not revert back into “squishy” resin blocks if close by to water. Hardened resin can also be put into a furnace to create an Amber Block. Amber blocks can be put into a crafting table in a 2x2 configuration to create Amber bricks. They can also be made into slabs and stairs, and have a “chiseled” variant similar to stone bricks. Crafted with two slabs over each other in a crafting table. 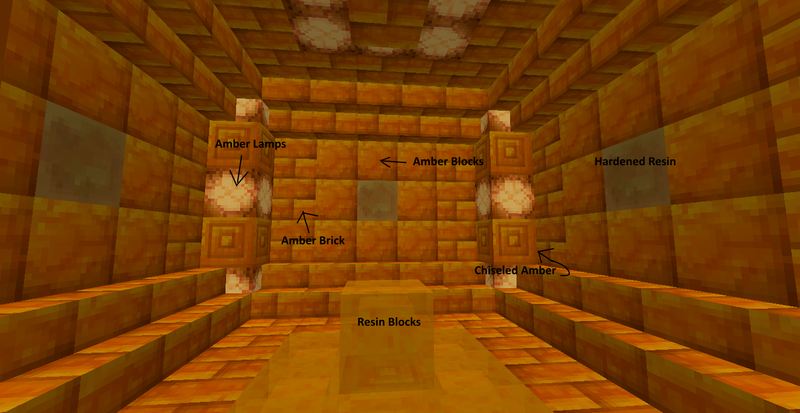 Amber is just another decoration block, until you surround it with four glowstone dust, which will create an Amber Lamp. This would be a new light source. The blocks look like this…. Mesas would definitely be improved with this addition. We need more giant bugs, to scare away the weaklings. I love the amber blocks! Support. If my PM's to you weren't clear enough, I can't see any negative in this. At least with the suggestion in this final form. Support, maybe you could reddit this? Cool i like the idea. I love Mesas. Build my base in them all the time. Got a problem with that? All joking aside, full support. I absolutely love this idea! It is a channel about building and being creative, currently playing on the Lake Laogai SMP. Yeah man, thanks for helping me think this through a bit! You were helpful! First off, thanks for the support! I'll just make spawners be in specific rooms then. That will make them less common. Also, no non-supporters so far. 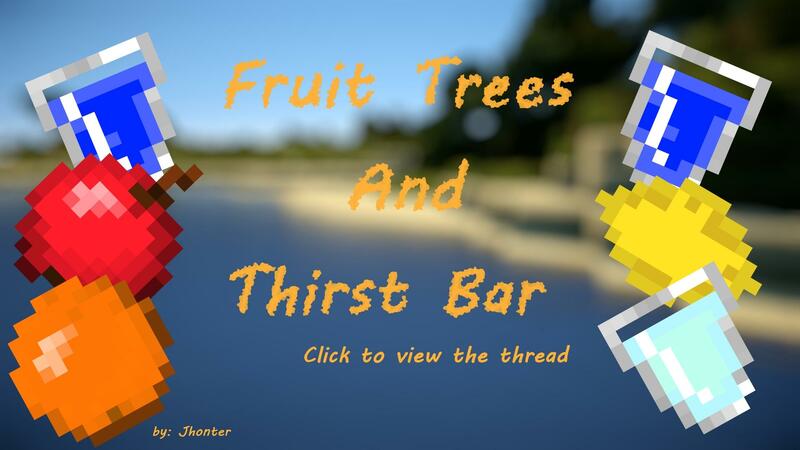 Should I make a Banner for this? This is so cool! I really hope a mojang developer see's this!!! Ok, I'll post it on the Minecraft suggestion Reddit. Ok, I'll get on that. I'll think about putting this in the suggestions Hall of Fame. But is there anything I should improve on before you do that?